The project involved naturally felled branches and broken young trees found in the Art Park. Ayres shaved off the bark to expose the smooth wood underneath and some are painted with a fuchsia color while others are left bare. 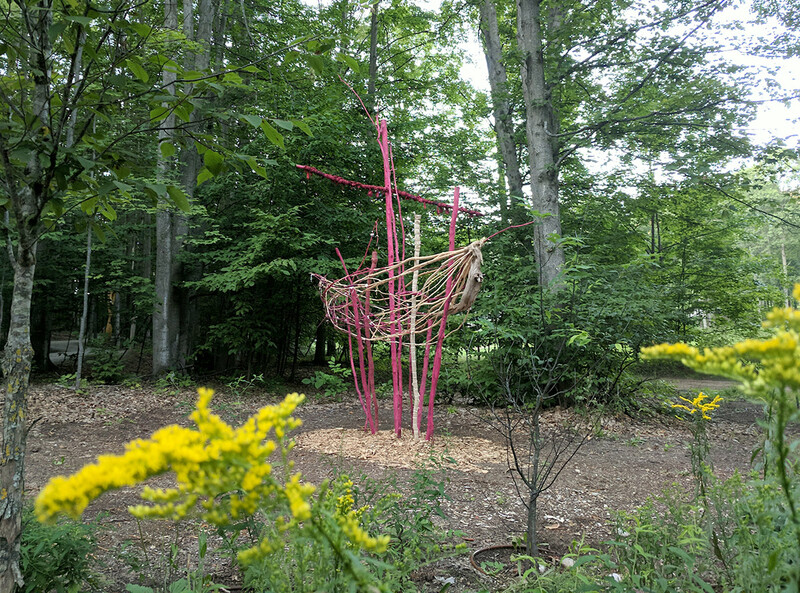 The sculpture is in the shape of a boat with branches protruding through the structure so that it hovers above the ground at about eye level. The artist used simple building materials and methods to put the work together such as latching with wire and then covering the heavy wire with natural fibered rope. Her sketches for this work show bared trunks and roots that have been eroded of land and appear to be free to travel. The trunks and branches of the trees in the boat are like masts that aided in propelling the vessel through the past to something new. In contemplation of the installation, observers may consider some of their own narratives about the journey of the trees to Michigan. The intention of this project is to create a number of these boats in varied locations around the world to promote the relationship between art, the environment and education. Ayres has been involved with the Art Park as an artist for many years and has created several ephemeral works over that time.